10kms from Sikar On Sikar-Jaipur highway, you see a road sign indicating Khatu Shyam Ji Ka Rasta (road to Khatu Shyamji). Just by driving 10minutes on this beautiful country road, one can reach a magnificant temple of Lord Rama in village Manda Madani. 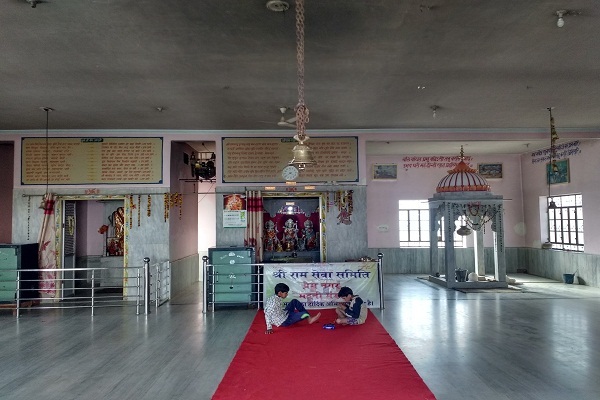 This place is helping Shri Khatu Shyamji devotees for last 300 years by offering them food, shelter and other services. The great seva dharma was started by the family of a brahmin, shri Ram Chandar Ji Maharaj. Can you imagine, how difficult it is to carry a Nisaan of Khatu Naresh for such a long distance. It's such a great tapasya, practiced by Shyam devotees for centuries. All the pilgrims coming from Palsana, exhausted due to cumbersome journey take shelter here before reaching Shri Shyam darbar. 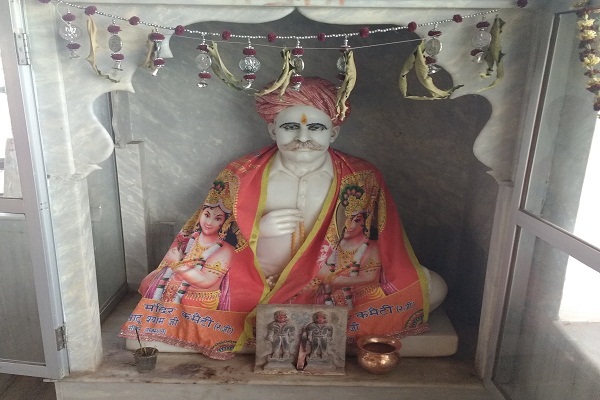 Before the temple was constructed by shri Ram Chandarji Masterji, the devotees find it difficult to stay as there was only a peepal tree as shelter and a well for drinking water. 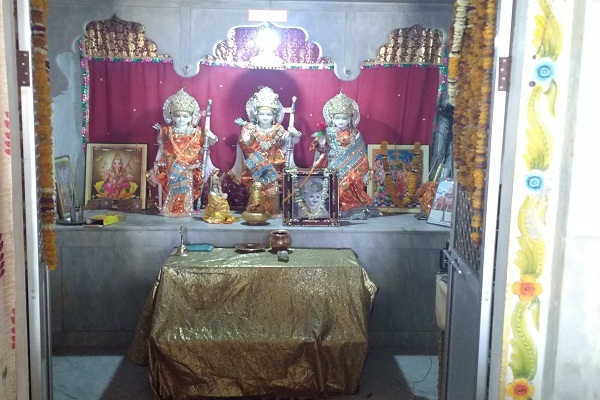 Masterji's son Shri Girdhari lalji and his three brothers constructed this temple in memory of beloved father. Now, devotees can stay and relax in the temple with ease. Hats off to such an amazing family and their commitment to service for Shyam bhakts. Large no. of saffron colored Hindutva flags are visible from a distance. This east facing Ram darbar (the court of lord Shri Rama), is located in the middle of large green fields all around it. The main deity is of lord Rama in standing posture accomplied by mata Sita and Lakshman.The main preist of the temple offers Aarti, Bhog and Pooja to the lord Rama in this garbh griha. Just look around the garbh griha and you can find the divine presence of Lord Hanuman, Devi Durga in the same hall. In one corner, the creator of this place, shri Ram Chandar Ji Masterji's statue reminds us the hardwork done by this karmyogi. 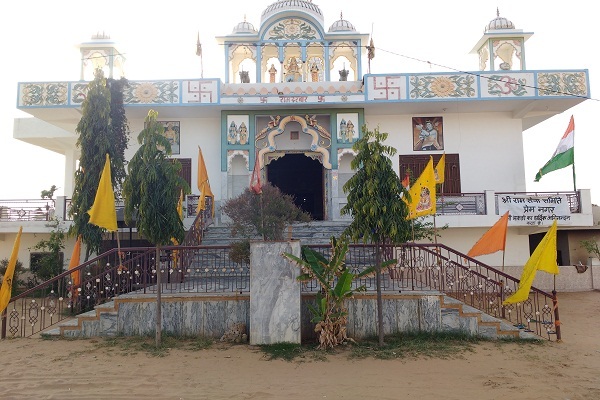 Shri Ram Darbar Temple is approximately 5 kms towards Khatu Shyam Ji Mandir from Palasana on Sikar-Jaipur highway. One can take a taxi from Khatu to reach the temple.